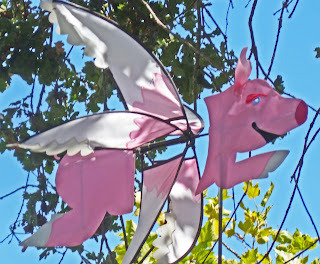 Sparks Nevada, 6:00 pm, center stage ‘Weapons of Mass Consumption’ were spotted. 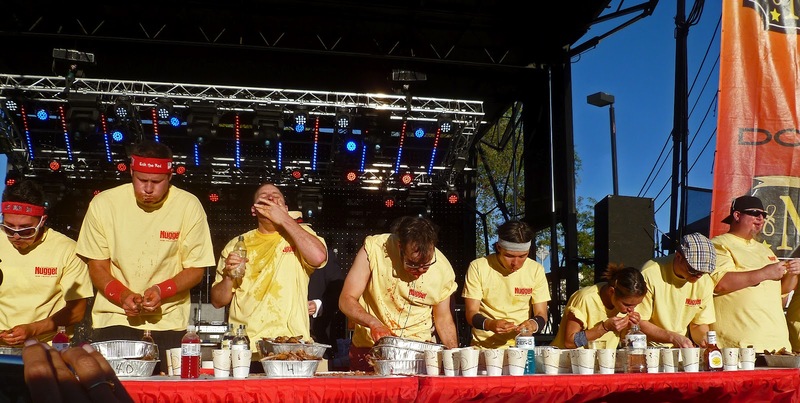 This group of professional eaters would all challenge our hero and past champion ‘Joey Jaws Chestnut’ in a contest of gastronomical greatness. This contest would last twelve excruciating long minutes. The object of this challenge was to eat as many ribs as possible. Would Joey remain champion? The plate was set and we patiently awaited the opening bell. 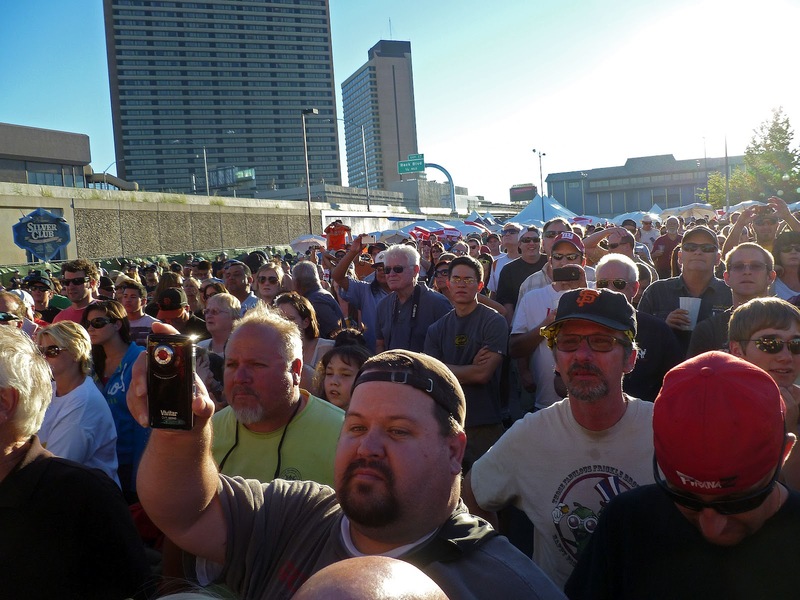 A huge crowd gathered in anticipation of witnessing the monumental event. We had to arrive early to claim our spot in the splash zone. We were confident our mentor and eater idol would not breach the unthinkable ‘Reversal of Fortune’. (When food matter leaves the mouth area involuntarily) . The announcer whipped the crowd into a frenzy with his snappy dialogue and verse. The contestants were introduced and we were ready to witness culinary history. Joey was in tip top eating shape. 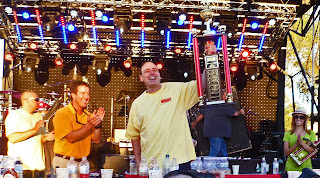 From the opening bell he demonstrated and gave a clinic in the arena of fast consumption of ribs. It was spectacular. The crowd roared, Ms. Goofy wept and I was shocked and awed of this food extravaganza. In the end Joey consumed eight pounds of ribs. His closest competitor Matt 'Mega Toad' Stonie ate or should I say inhaled seven and one half pounds of ribs. What an event. We are now going to duplicate but in a much slower pace some rib consumption of our own. I received another invitation to spend an afternoon at the U.T.B.C. 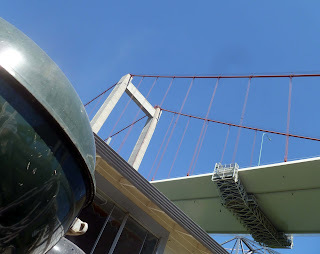 (Under The Bridge Club). This is an exclusive Men’s club that meets one a month at the Crockett Bass Club. The Crockett Bass Club is located directly under the Carquinez Bridge. 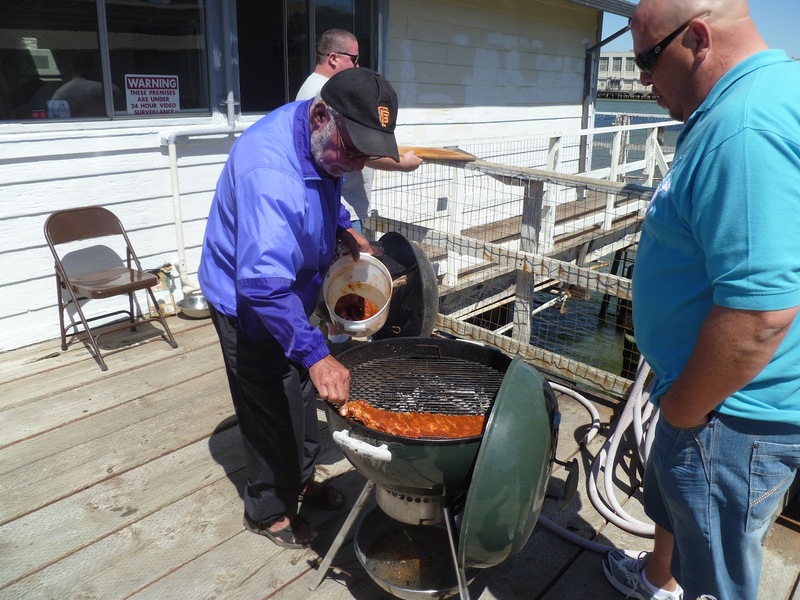 The purpose of this club is to eat, drink, fish, watch sports and socialize. They usually have a cooking theme and this month was proclaimed a rib cook-off. 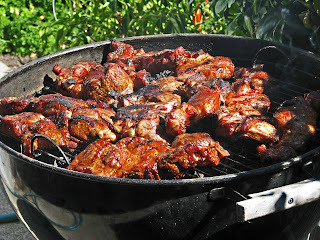 I am no stranger to ribs and this sounded like a lot of fun. Several Weber’s were set up outside to handle our cooking endeavors. Everybody had their secret rubs and techniques to share. These Weber’s got a workout this afternoon. One was filled with mesquite charcoal and the other brickets. Hickory, peach, apple and several other woods were added to the fire to create smoky results. We all supervised with plenty of cold beverages to whet our thirst. The ribs were done and it was time to eat. This meal would be vegetable free. 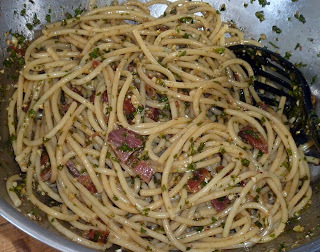 In fact except for some fresh pesto pasta with bacon that I had made, this would be a rib fest only. I guess you could count the guacamole and salsas as vegetables. 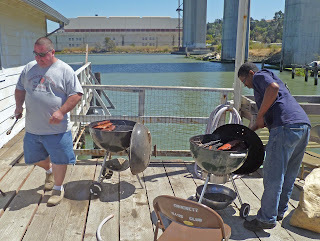 When you put a bunch of men together around a barbeque you will be rewarded with some good eats. Each rib was different and delicious. John made a home made barbeque sauce that was rockin’. I think his secret ingredients were brandy and chipotle peppers. It was another terrible day of sun, fun, ribs, beer and friends at the U.T.B.C. That was what I tried to tell Ms. Goofy when I got home. She did not buy that for a second because of the grin and sunburn on my face. It was another beautiful weekend at Konicti Vista. The sun shined brightly and kept us searching for shade. Twenty one barbeque warriors staged battle for the coveted Grand Champion title. Being a judge has its perks. We were situated in an air conditioned casino. Our hardest duty was to not feed the slot machines too much. This event is one of our favorites. We spend Friday night at the casino hotel to be rested and refreshed for our Saturday judging duties. Friday evening we get to visit with our competitor friends. 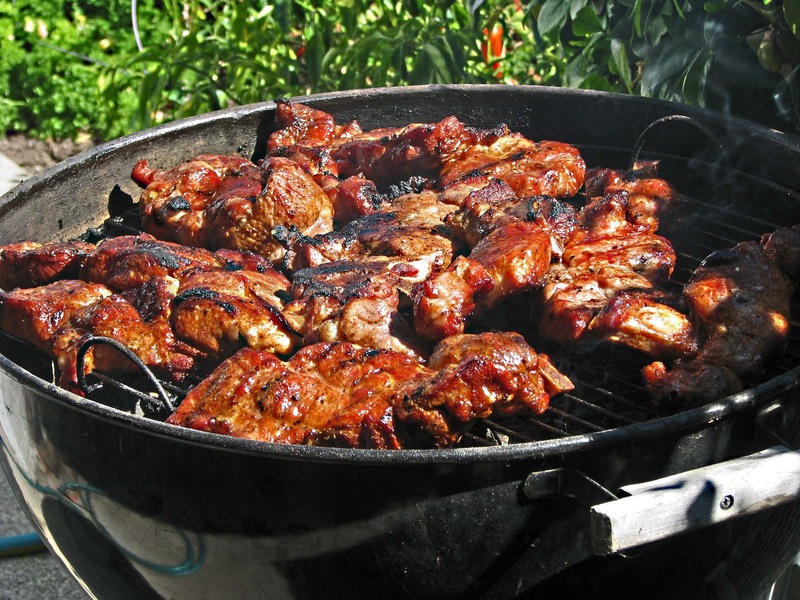 You would think with all the barbeque we tasted and judged we would be full. Yes we were but after consuming the 16 ounce chicken fried steak the night before we discovered ‘The Ripper”. 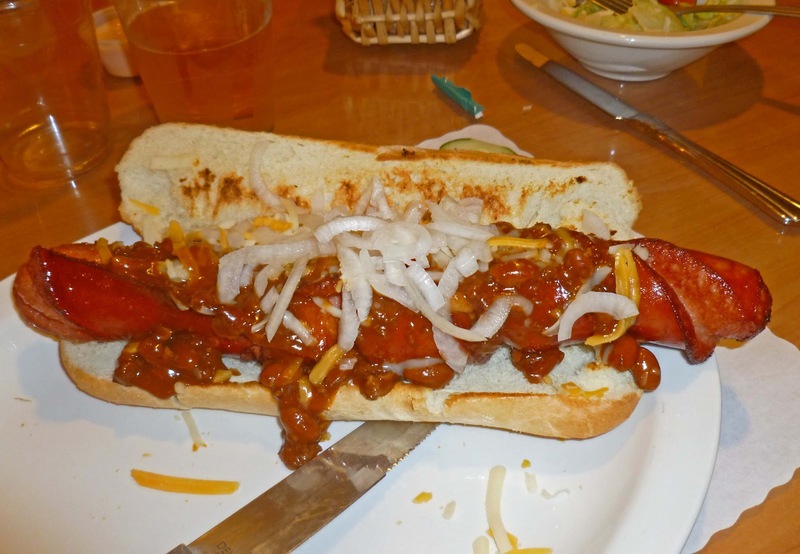 The Ripper is an 8 ounce hot dog that is deep fried till it rips open. 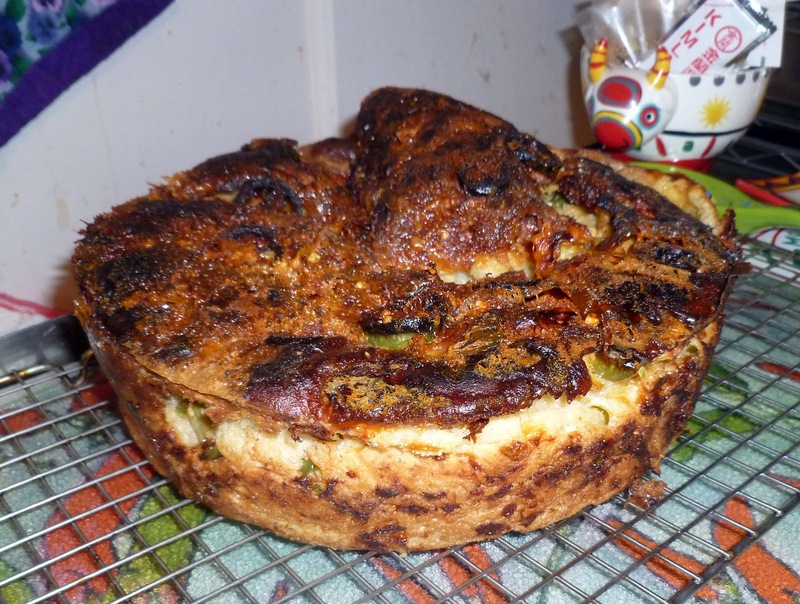 It is then smothered with chili, cheese and onions. We finished our judging duties around 1:00pm. When the sun began to set my stomach rumbled in anticipation.. It was time to experience ‘The Ripper’. It was everything you could imagine. Ms. Goofy was not too pleased later in the evening. The barbeque we tasted was excellent. 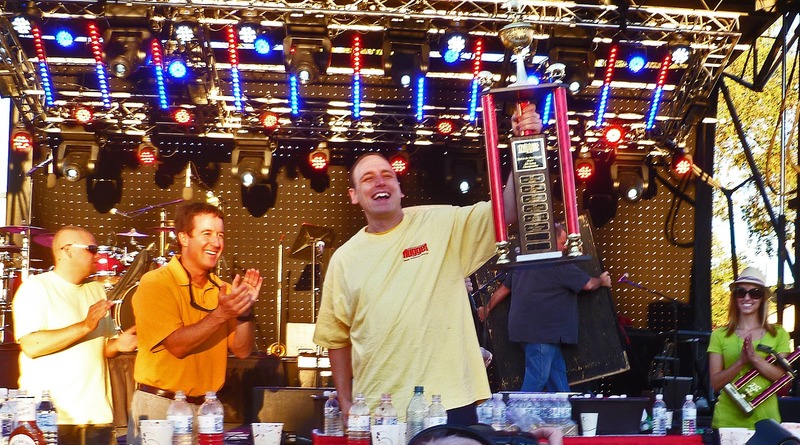 We never get tired of judging the best barbeque in the nation. Unfortunately we can only pick one overall winner. 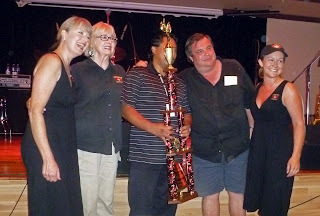 The barbeque team ‘Woodhouse’ was crowned ‘Grand Champions” Congratulations! This weekend was an exercise in consuming mass quantities of food. 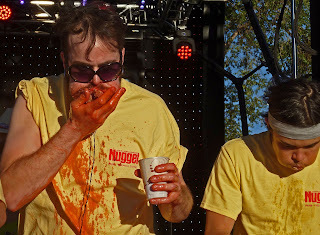 We will have to visit the salad bar for several days before we go to Sparks Nevada for the ‘Nugget Rib Cookoff’ It is a tough job but somebody has to do it. 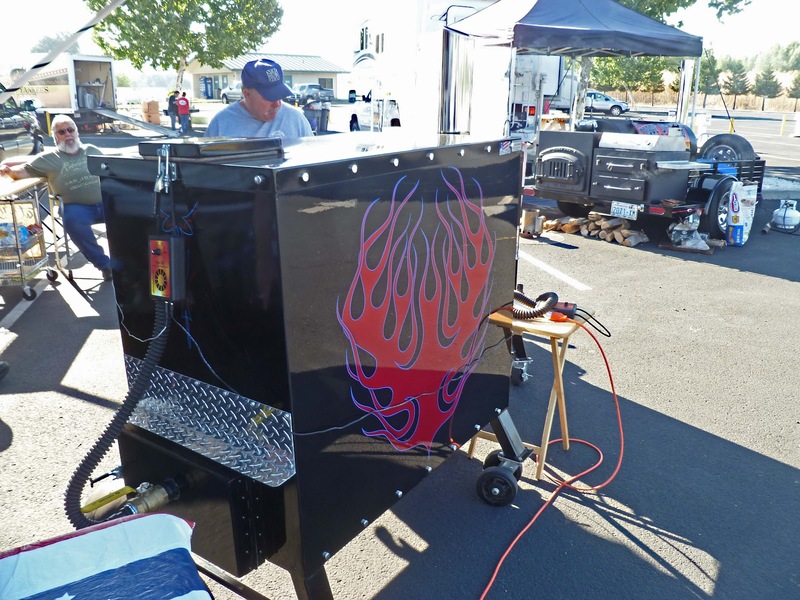 It is the night before the big BBQ contest. We have arrived at Konicti Vista Casino and have checked in.at the hotel We explored the grounds and visited with a few of the competitors. 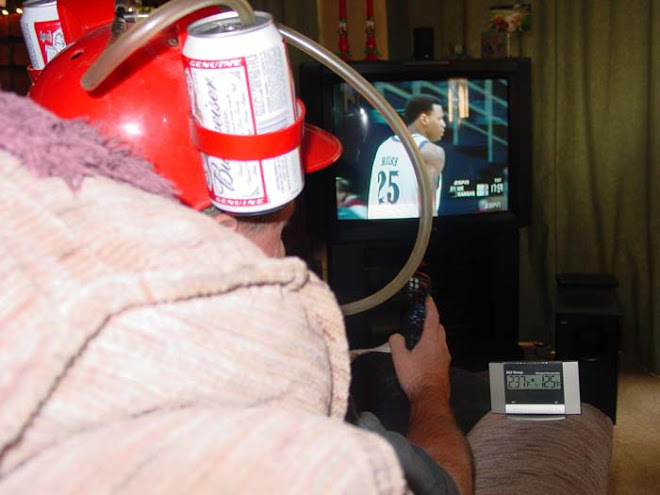 It is important to stay focused before a contest. Staying hydrated and taking in nourishment is very important to stay on top of your game. I just wanted to share this picture of a sixteen ounce chicken fried steak that we had at the coffee shop. It is all about the gravy. Let the contest begin. This weekend we will be in Lakeport California at the Konicti Vista casino. The 'Smokin' on the Water' barbeque contest will be held. 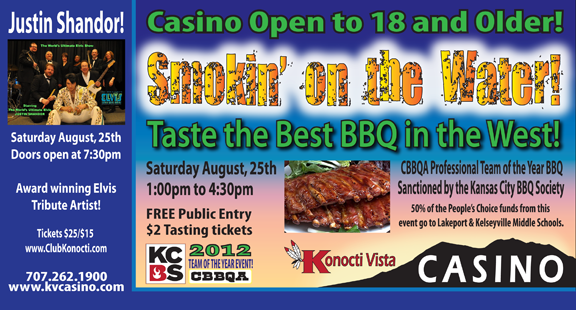 It will be a great opportunity to taste and experience some of the best BBQ in the nation. Ms. Goofy and I will be there wearing our judges badges. Hope to see you there. 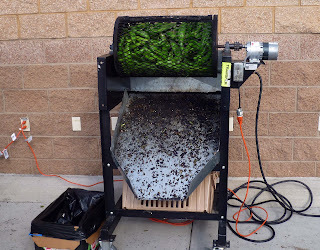 They are back; New Hatch New Mexico Green Chiles. These are the gold standard of the long green chiles. Anaheim chiles are nice but are only a distant cousin of the king of peppers. This time of year supermarkets are receiving their limited allotment of peppers from New Mexico. We always take advantage of this short window of pepper opportunity. Raley’s in Alameda had our peppers and a roaster to toast the skins with fire. It is a good idea to roast the pepper. The skins are fairly thick and the roasting makes for easy skin removal. 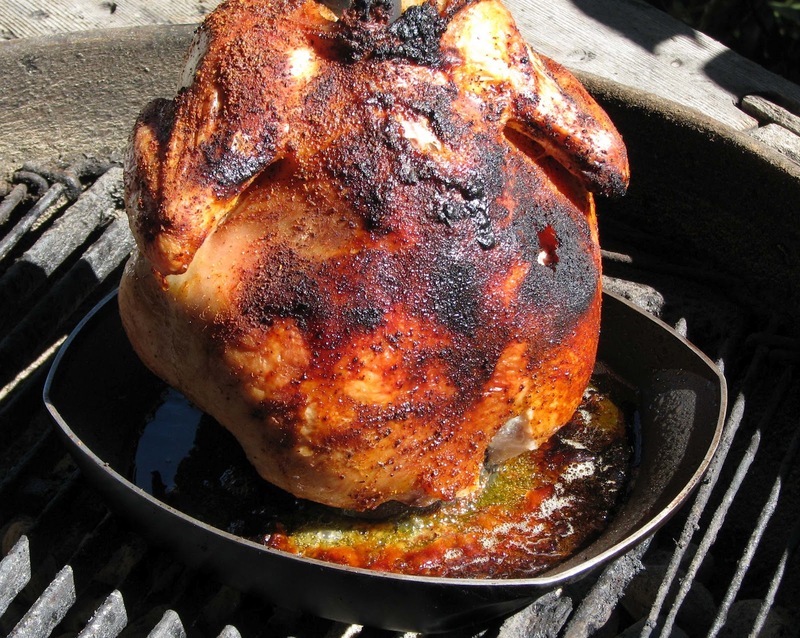 The roasting also imparts a smoky flavor bringing out the natural sugars. Raley’s advertised a 9:00 am roasting time and we arrived at 850 am. There were two roasters going full blast when we arrived. The smell of roasting peppers was intoxicating. There were several people already waiting for their peppers. We went into the store to pay for our purchase and the wonderful smell of toasting New Hatch peppers followed us to the cash register. I may have begun to drool anticipating the meals to come. We got our peppers and jumped into the Racing Honda to return home. The car now had a roasted pepper air freshener that we would like to patent. 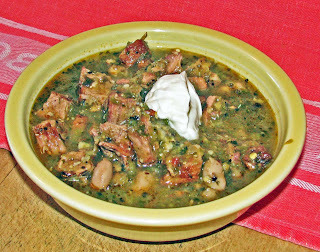 Chile Verde was on the menu tonight. Our barbeque was stoked and some vegetables and seasoned pork was grilled. The roasted vegetables and peppers were placed in a food processor and pulsed. The meat was chopped. All was placed in a pot and simmered. Green gold was created. 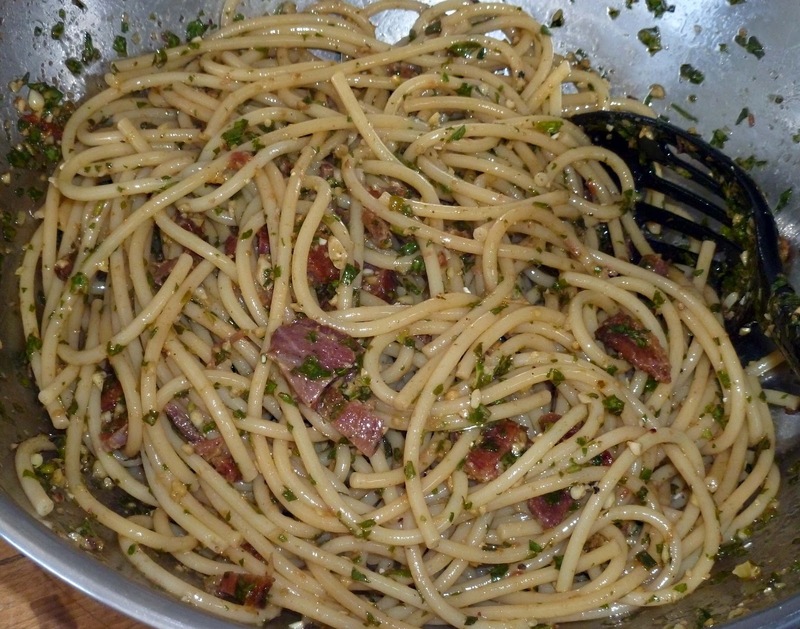 This dish is comforting and satisfying. The peppers have s slight kick that leaves your mouth warm with joy. We love Hatch Green Chiles. After 32 long years at the salt mine, I hung up my hard hat and began a life of leisurely living. It was time to sit back and relax. That is until yesterday. Yesterday, I started a new job. This job was offered to me and it just seemed like a good fit to my new lifestyle. It will involve a commitment of one day a month. I will sit around a lot and be out doors. A lot of produce will be involved. I will be the Manager one Friday of the month at the Richmond Farmers Market. Yesterday was my training day and it was fun. 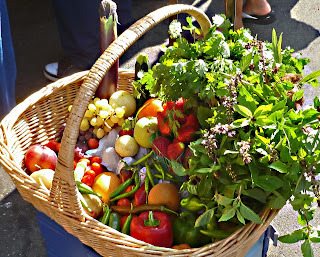 Once the booths are situated and all the farmers are settled in, it will be my duty to gather the weekly prize produce basket. What a hoot it is going booth to booth and just plucking my whims and fancy of a selection. 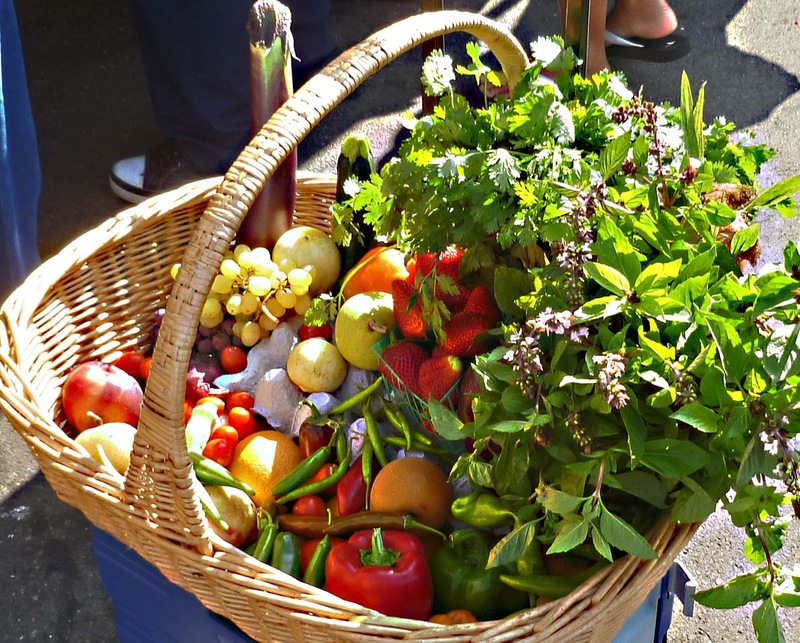 Some lucky winner will receive this cornucopia of fresh produce. 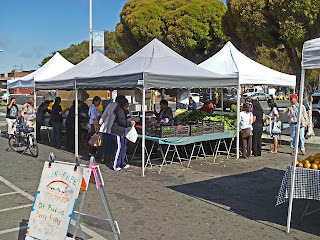 Then I get to sit around and soak in the smells, flavors and character of the market. I would like to share some of my experiences at my new job. In the future we may showcase some of the farmers. What do they grow? When? Where? How?, and possibly some recipes. This will be a job that I actually will look forward to going to. 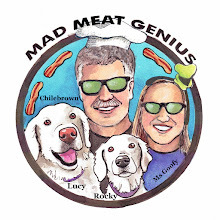 Stay tuned for this new chapter in the life of a Mad Meat Genius. 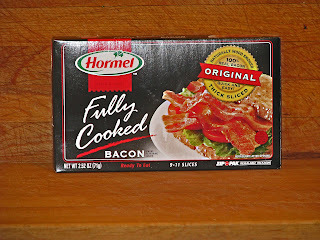 One of ‘Bacon Takedown’s’ sponsors was Hormel. They were giving out free samples of their product; ‘Hormel Fully Cooked Bacon’ and we took them up on their offer. This product had my curiosity spiked because it was fully cooked and its ability to be stored on the shelf with no refrigeration. 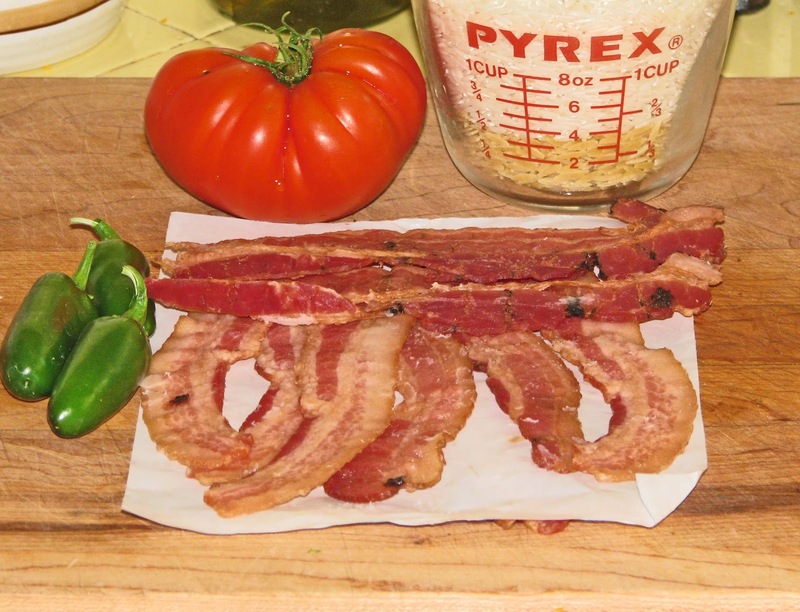 Hormel claims this bacon is 100 percent real bacon, naturally wood smoked, and gluten free. In the name of science and Mad Meat Genius’s commitment to all things bacon we will give this bacon a try. We opened the box and cut open the reseable plastic pouch. It sure looked like bacon but it did have a pale anemic look. There was also some alarming black spots or dots arranged willy nilly through out the rashers. It looked like some burn marks but there was no pattern such as grill marks. I called the 1-300 number to find out what these unappetizing marks were. The operator explained that the black marks were excess sugar from the cure that had burned. It was perfectly safe to eat. Strange but true? This bacon is fully cooked so a taste was prudent. Yes, this tasted like bacon. It was salty, chewy, meaty, kissed with a little smoke. This bacon did need a crisping. Except for the texture it was not that bad. 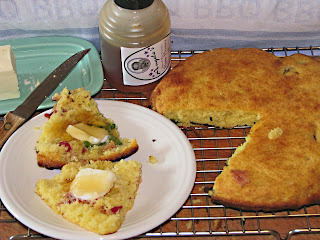 Since we are using convenience bacon we thought it might go well with some convenience corn bread. We picked up this tube of ‘Uncle Bucks’ corn bread mix at our last stop at ‘Bass Pro Shop’ in Vegas. This was an impulse buy for sure. Cornbread is very simple to make but who could resist Uncle Buck. Preparing this test batch could not be simpler. We cut up or fully cooked bacon and added Uncle Bucks mix with milk and an egg. 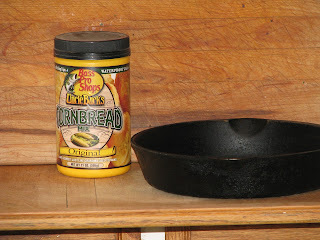 Our trusty black iron cradled our corn bread in a hot oven for 20 minutes. The bread came out of the oven smelling delicious. We could not wait and cut into this corny bread immediately. Butter and honey adorned this sample of convenience. This bread was the bomb. The bacon actually tasted pretty good. I would have never known that this was fully cooked bacon that did not need to be stored in a refrigerator. 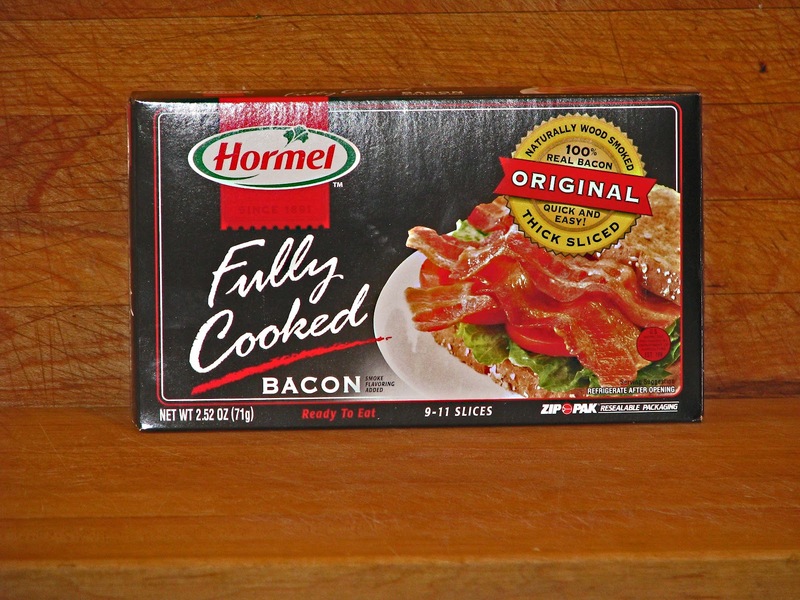 ‘Hormel’s Fully Cooked Bacon’ is a product of convenience. If one did not have the time or energy to fry up some bacon, this may be the product for you. 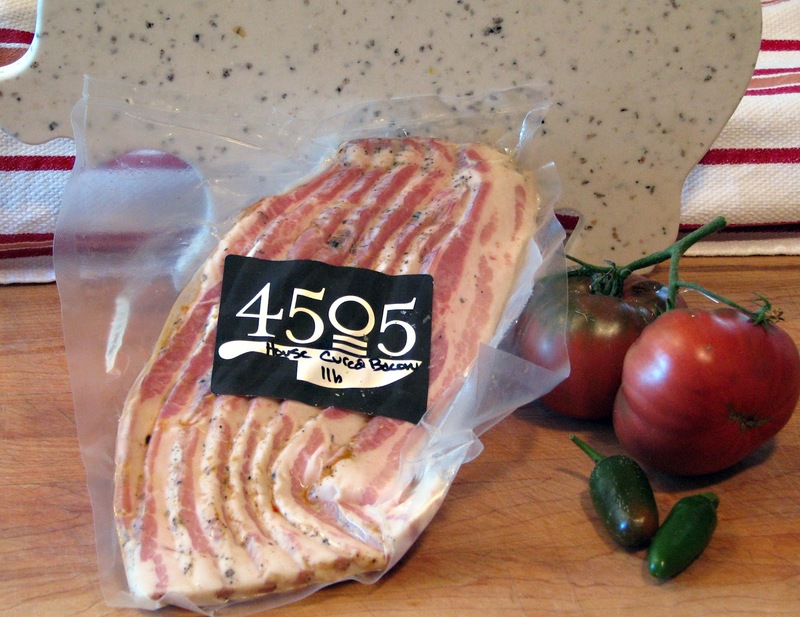 This bacon would be perfect for backpacking. I will admit, out of the package it is a little scary looking. The black marks are unappetizing. The taste would compare to standard Supermarket bacon. 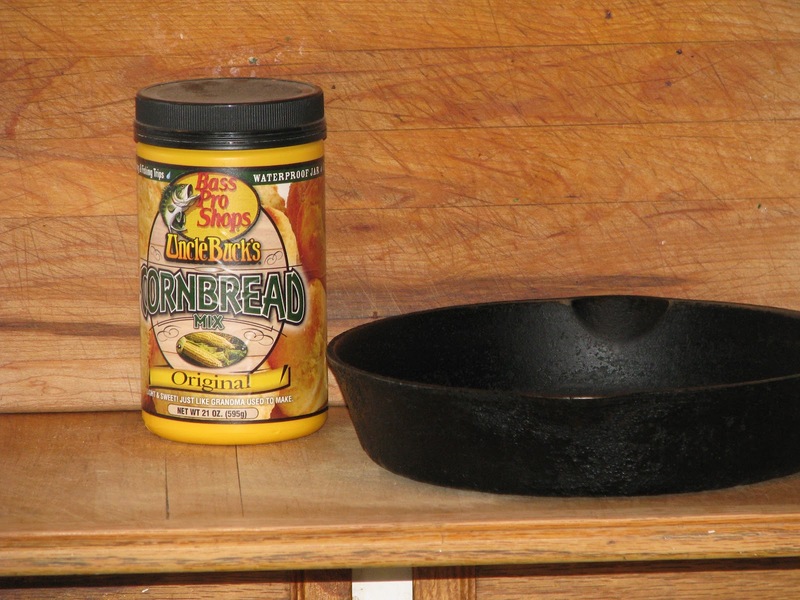 By the way Uncle Buck’s corn bread mix is pretty darn decent. If I ever go backpacking these two products will be on my list. You may have heard of my love for burnt ends. Burnt ends are cubes of the point end of the beef brisket that have been heavily seasoned and smoked for hours. The long cooking time will remove most of the fat and leave a caramelized piece of meat candy. When done correctly they can be a culinary exclamation point. Here on the West coast most BBQ restaurants do not serve burnt ends. 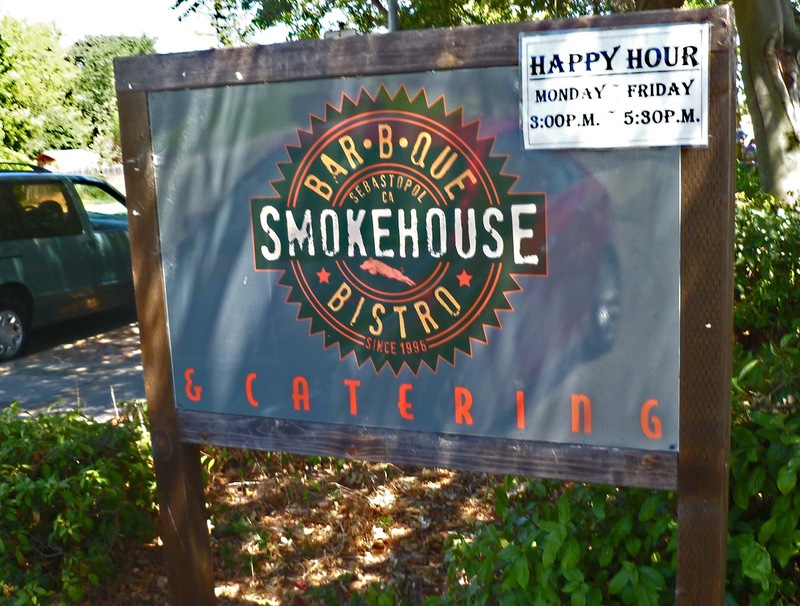 BBQ Smokehouse Bistro & Catering located in Sebastopol California has burnt ends on the menu and we are on a mission. It is 90 plus degrees at the Gravestein Apple Festival and we are in need of shade and nourishment. 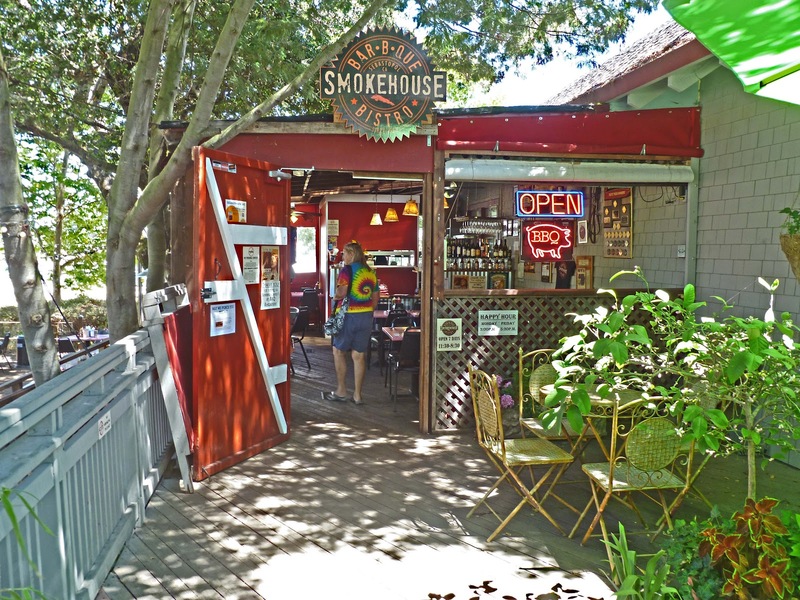 A couple of blocks away, a cool shaded outdoor patio of the BBQ Smokehouse is waiting for us. We walk through the doors and are greeted by, fun bbq kitsch wall decorations, half a dozen small tables and counter to pick up orders. The walls are open to the outdoor, shaded, tree lined, seating area. A bubbling fountain is surrounded by picnic benches. 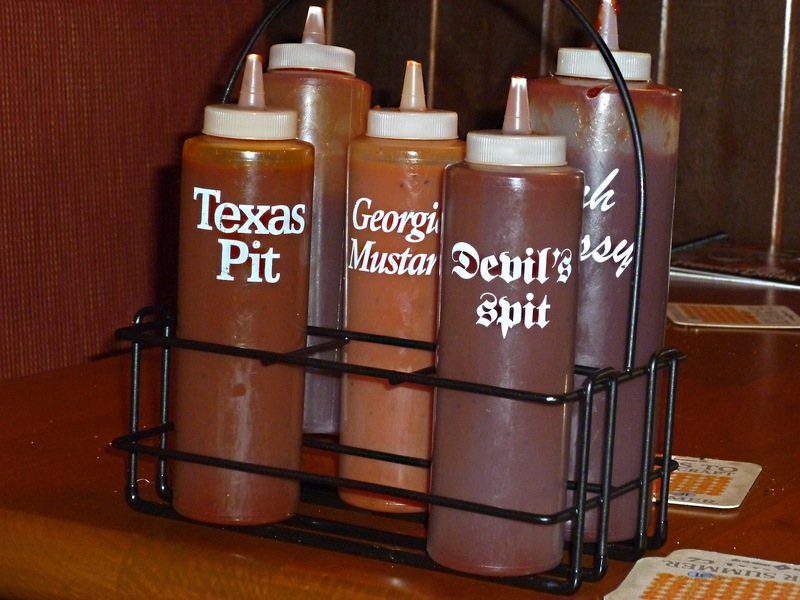 Each table has their own arsenal of bbq sauces. It is very pleasant and cool. We placed our orders and began to investigate our table sauces. 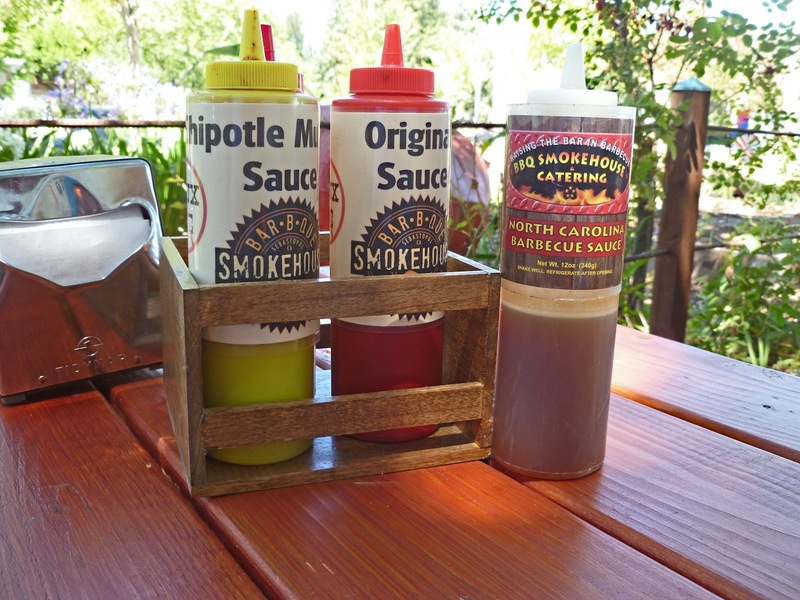 Chipotle mustard, North Carolina, Original and a mystery sauce are waiting to be sampled. 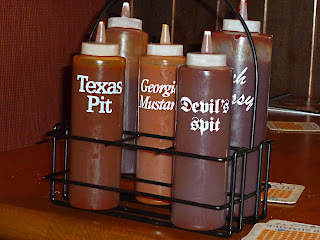 These sauces must have seen better days because they had all separated and needed to be shaken. Maybe it was the heat or shelf life but none of these sauces were worthy of a letter home to Mom. Our dishes arrived and we were ready. The plate of burnt ends was beautiful. The meat had a brown caramel hue that begged for consumption. The ends were topped with some pickled onions. 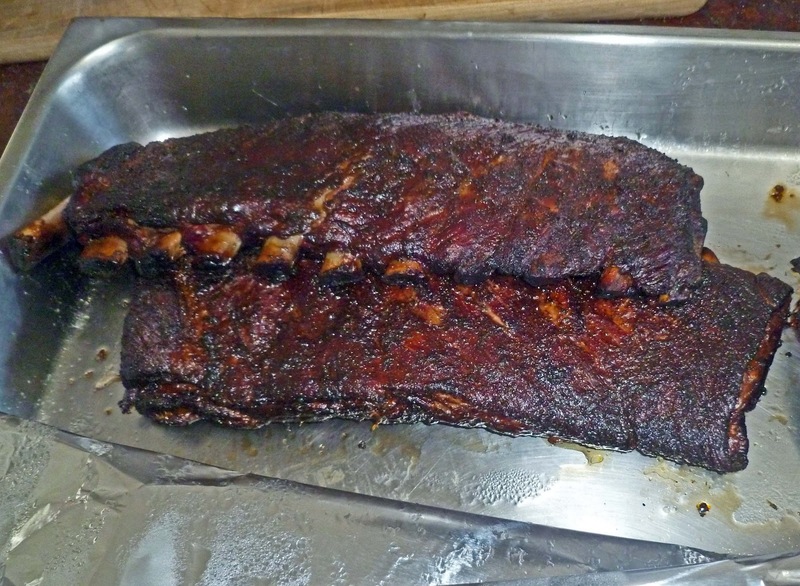 The first bite revealed the 24 hours smoke. Tender but with little chew from the bark had me swooning with burnt end fever. The pickled onions were a perfect accompaniment to this plate of meat candy. The tart sweet vinegar tamed the extreme richness of my ends. Ms. Goofy had a plate of chicken that consisted of two thighs. She enjoyed the thighs but wished for possibly a wing or breast too. Unfortunately our side dishes are not even going to get a mention in this review. They all were just flat. BBQ Smokehouse Bistro & Catering satisfied my burnt end craving for now. They have a beautiful, soothing, cool outdoor seating area. The meats were a hit but the sides and sauces were a miss. They have a nice selection of micro-beers which we enjoyed. 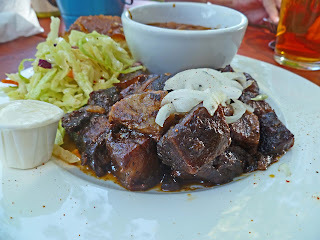 We may someday return but for now we have a new lead on another restaurant with burnt ends. 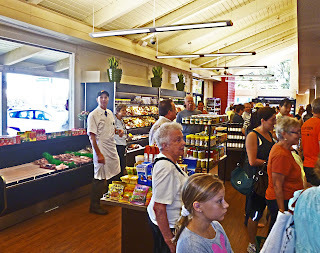 Dittmer’s is a destination German meat palace, our Meat Adventure today. A fire in January of 2011 has kept this meat emporium closed until now. Dittmer’ Gourmet Meats & Wurst-Haus has a well deserved reputation for making great German style sausages, bacon, ham, various lunch meats and so much more. 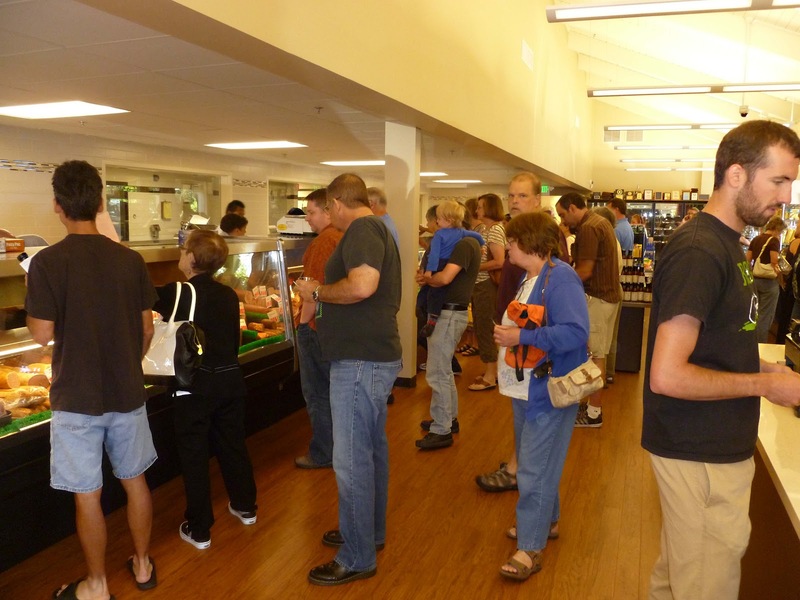 A lunch counter creates hundreds of different sandwiches for the populace of Los Altos. 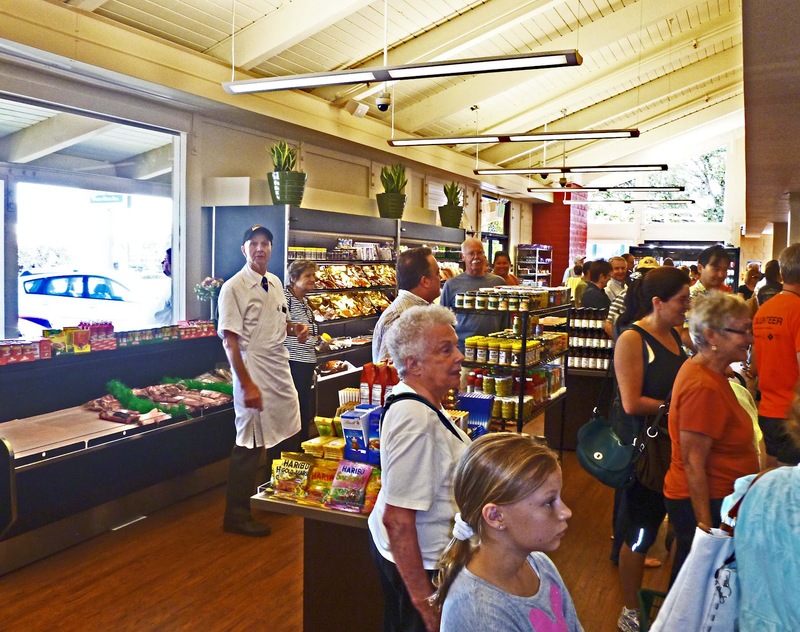 Dittmer’s has rebuilt their store several blocks away from the original location in a larger, more modern building. The new Dittmer’s is located in a very plain non-descript building. A small street sign will be your only clue of the meaty delights to come. Today, because of the opening, a barbeque and musician was set up in the parking lot. Dittmer’s did no advertising of this Grand Opening except for Facebook. I think all 4,710 of their friends were here today. It was crowded but that did not stop us from squeezing in and grabbing a number. 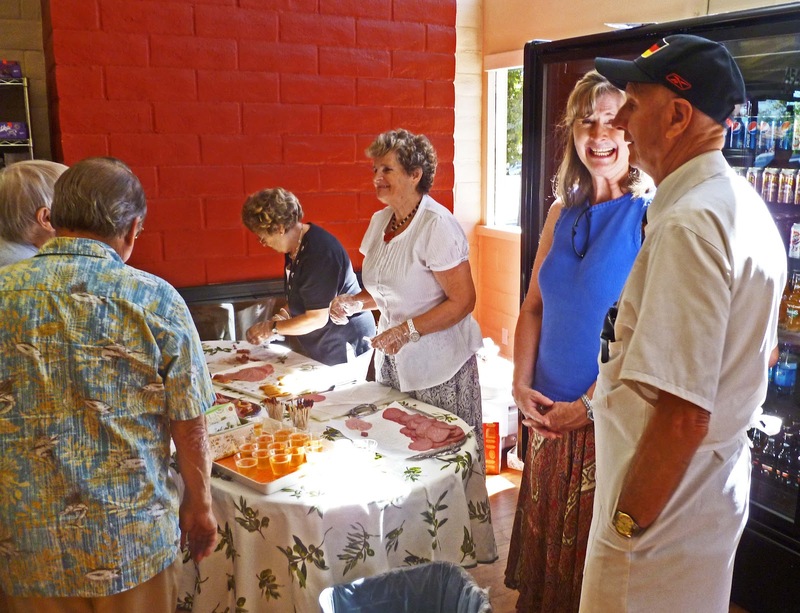 There were lots of meat & cheese samples to celebrate this rebirth. We had our fill and then some. 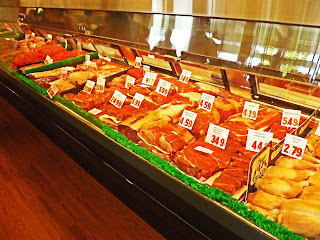 There are lots of refrigerator and freezer cases to browse the enormous selection of meats. 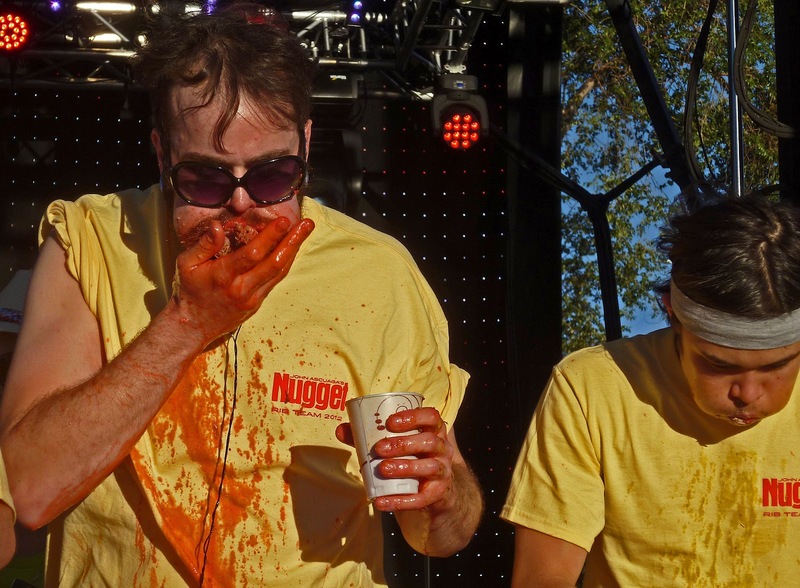 This is a candy store for the Mad Meat Genius. Shelves of German products are also displayed for purchase. Finally our number was called. 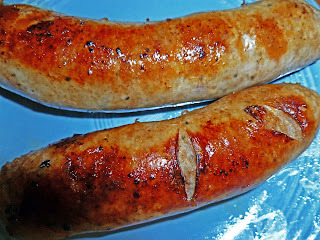 Sheboygan, Brats and bacon was the foundation of our shopping basket. 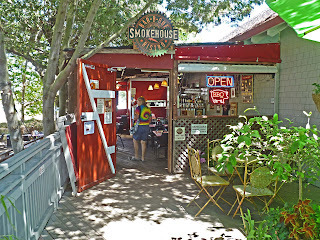 Several smoked pork chops could not be resisted. A twenty six ounce rib-eye steak beckoned me. This steak was so beautiful it brought a tear to my eye. With a full cart of meat we left Dittmer’s. Welcome back old friend. 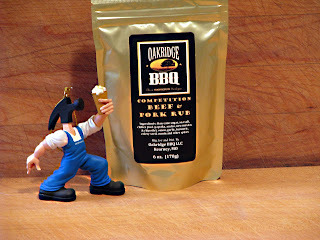 We have been having a lot of fun trying out different rubs from Oakridge BBQ. 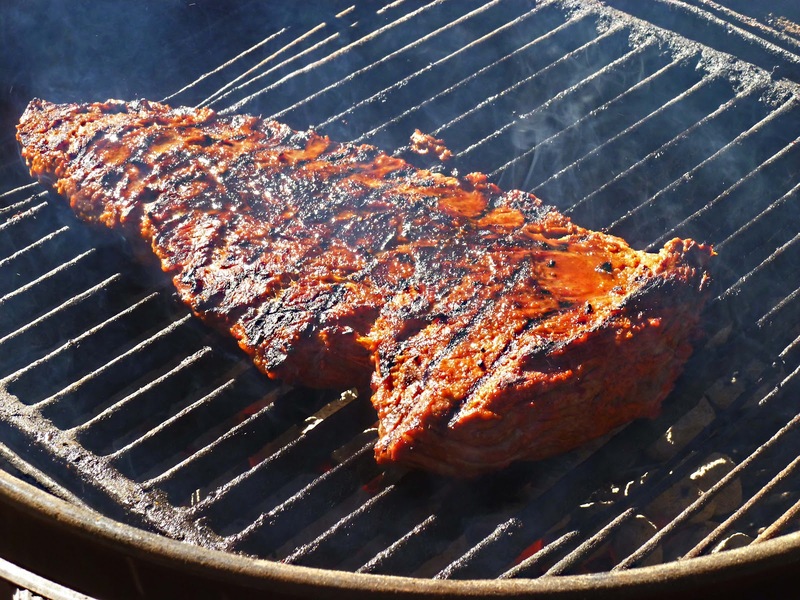 It is not like we ever need an excuse to fire up the grill but these rubs have kept us busy. One of our favorites is the 'Habanero Death Dust'.Even though it has an ominous title it has flavor that cannot be beat. Beef Cheeks, another Mad Meat Genius first is on the barbeque today. I saw a package of beef cheeks at our local Wally World and was curious. It was shrink wrapped and looked like the darkest little red meat roast I had ever seen. Once home, in the kitchen, the wrapping was removed and the true nature of this beast was revealed. This was not a roast but several flaps of sinew and fat covered beef. It was not a pretty sight. A sharp knife dispatched the unwanted meat transgressions. 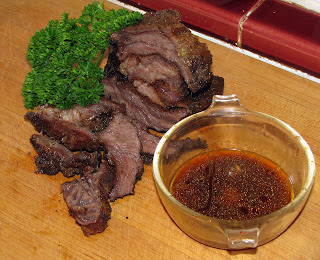 The cleaned meat was rubbed with spices, rolled into a roast and secured with cotton twine. A trip to the apple wood fueled smoker for a low and slow baptism and we were cooking. Many hours later we were rewarded with some of the most tender and flavorful beef. I would compare the texture to slow braised veal shank. It was fall apart delicious. A lot of effort went into this meal. This was a flavorful adventure but not one that will be repeated soon. This is the first weekend in over a month that we have not been involved in a BBQ competition. Needless to say the Meat Adventures continues. 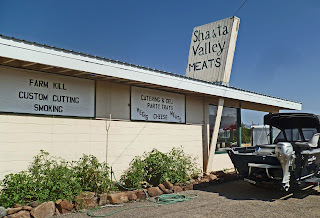 Last weekend we were in Montague, California and we found ‘Shasta Valley Meats’. 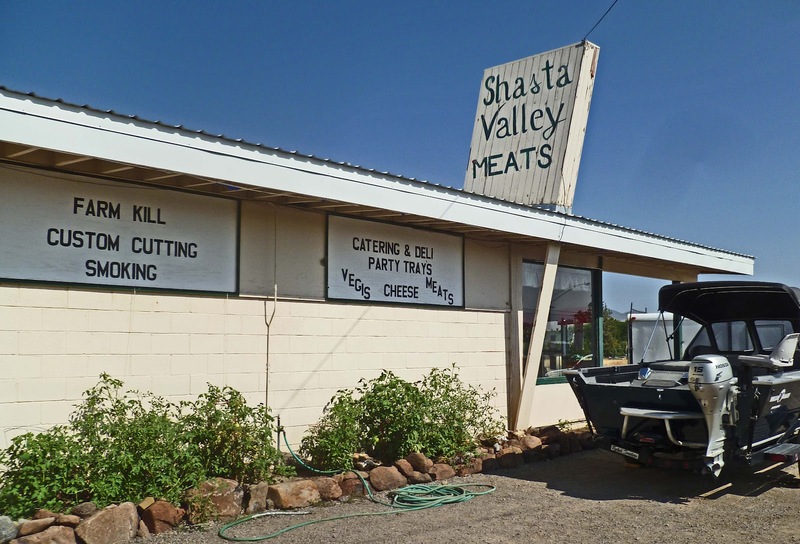 Shasta Valley Meats is a local butcher who specializes in processing local farmers and hunter’s meat needs. We had to pay them a visit. 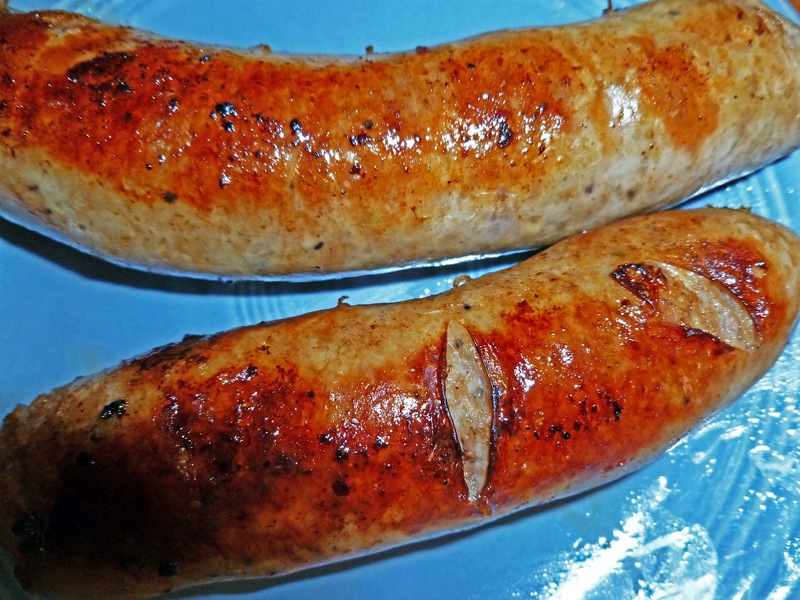 They just happened to have a fresh batch of bratwurst that had our name on it. We grilled them and enjoyed them immensely. Nest on the grill was a marinated flank (flap) steak. What made this marinade special was the red curry paste and lime juice that covered it. Our local International market sells small cans of red curry paste. This was combined with fresh squeezed lime juice from our lime tree in the backyard. A little vegetable oil was added and all was put in the ice cave for several hours. A dusting of salt and pepper and a blast of fire from mesquite charcoals finished our spicy meat treat. Next, on the fire will be some beef cheeks. Stay tuned! Welcome back to the Bacon Revue. 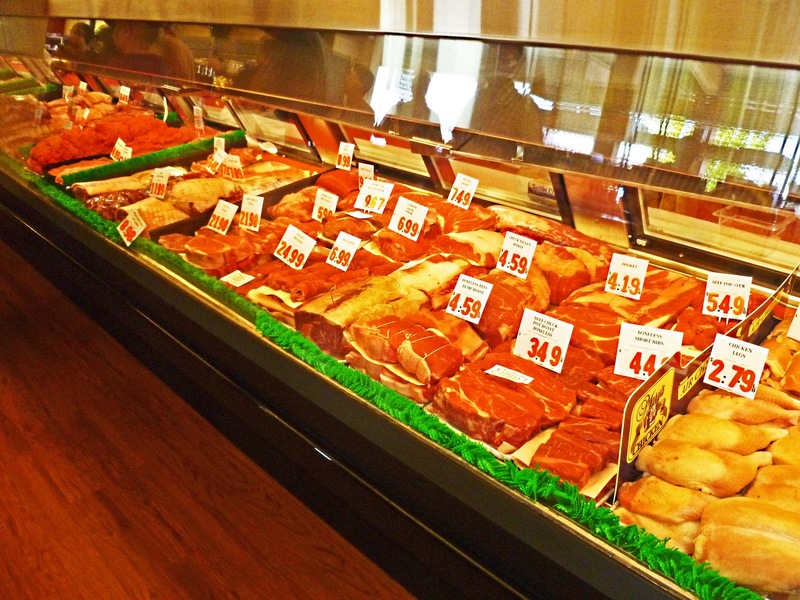 Dust off a seat and soon the curtain will rise to reveal tonight’s entertainment from one of our favorite butchers ‘4505 Meats’. 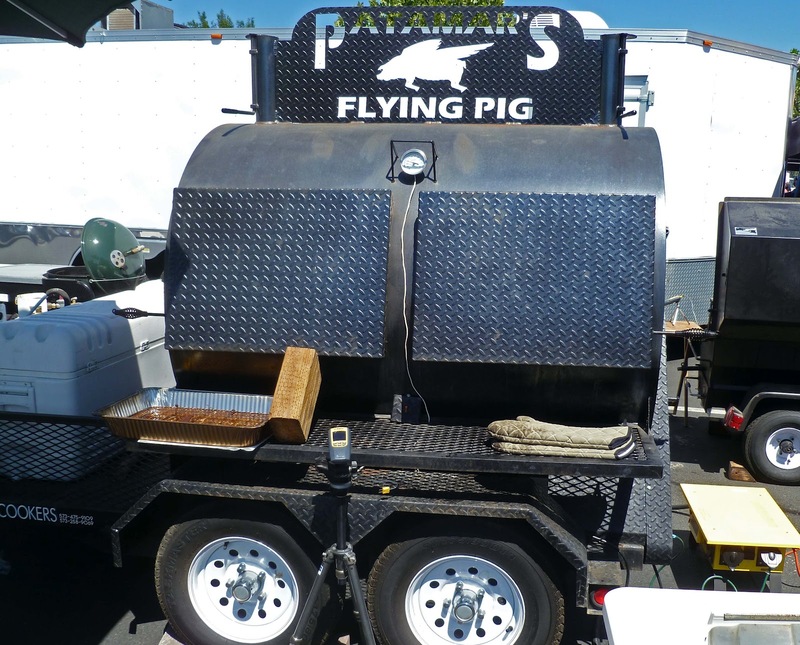 They are the makers of the bacon hot dog and we have high hopes for this cured swine belly. 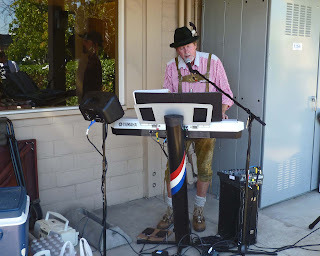 We ventured to the Lafayette, California Sunday Farmers Market to procure tonight’s act. We would like to tell you about the performer on stage tonight, but, all we know is that this is 4505 Meats ‘House Cured’ bacon. We asked the perky, cheerful vender about the process, cure, sugar, smoke, and pedigree of the bacon. She chirped; ‘It is the house cure’. We asked if maybe she could inquire and she promptly asked the friendly cook. He very nicely informed us that the bacon was their ‘house cure’. Well there you have it. Your guess will be as good as mine about our bacon performer tonight. Once home and out of the package we were very impressed with the appearance. The fat was pure white with a good meat to fat ratio. This just had the look of a heritage or heirloom variety of swine. 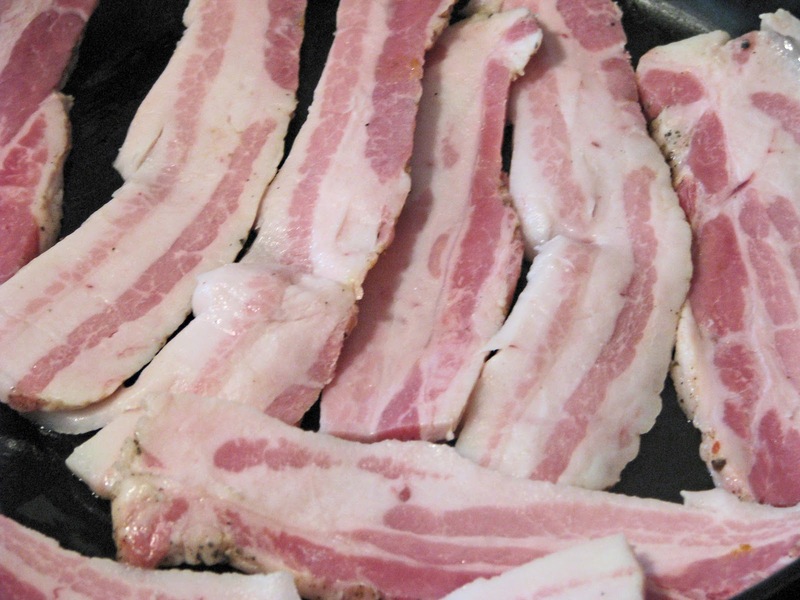 Immediately the slices of our house cured bacon was dispatched to our trusty black iron skillet. They fried up crisp emitting a beautiful aroma that only superior bacon can produce. The flavor of this pork was meaty with a slight beef like flavor. It was heavenly. The components of sugar and salt were perfectly balanced. Smoke was absent on this batch of bacon. 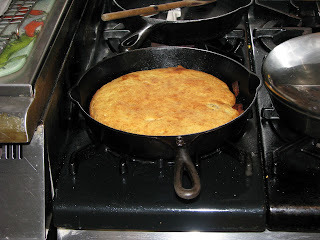 Some jalapeno cheese bread was cooked in our Dutch oven and some of the best ‘BLT’ ever was consumed. 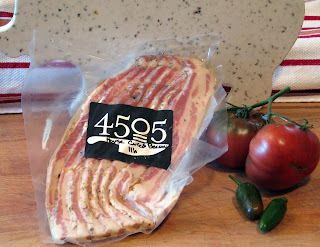 ‘4505 Meats House Cured” bacon may be a mystery of origin but it is a treat to experience. I would wager that this bacon was made with an heirloom variety of pig because of its flavor and appearance. Even though this bacon was lacking in the smoke department we will give this 4 stars out of 5. Everybody loves a mystery. 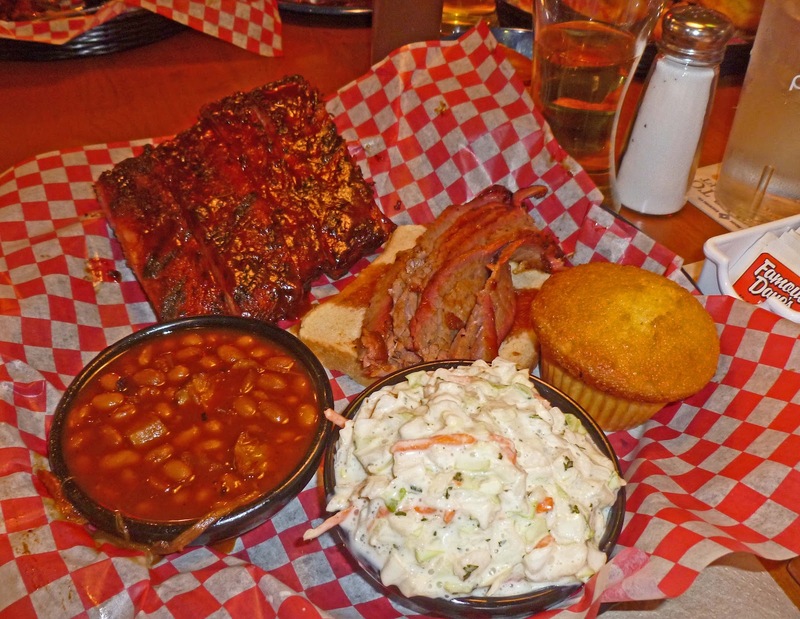 Famous Dave’s has been on our bucket list of restaurants to try. 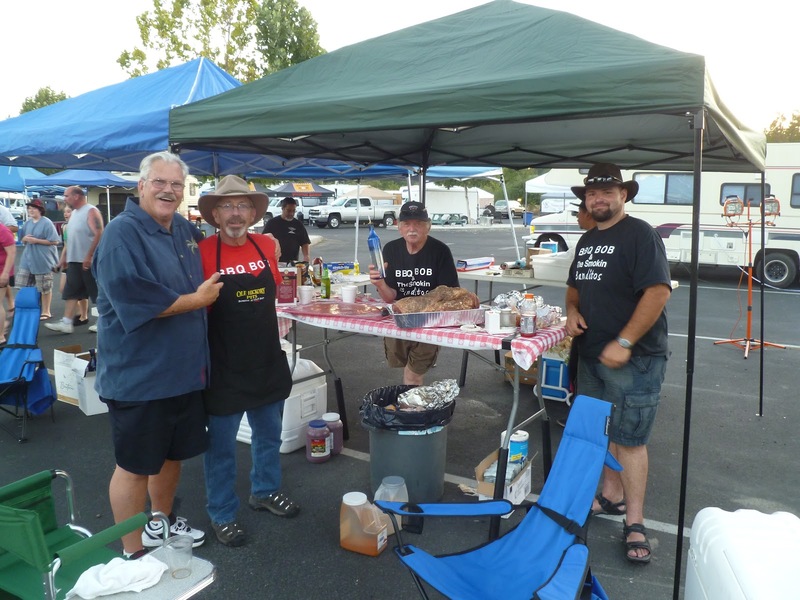 We had just finished judging four meat categories at a contest in Montague, California and were spending the night in Redding with our favorite Bro & Sister in-laws. This was the perfect opportunity to visit Famous Dave’s. 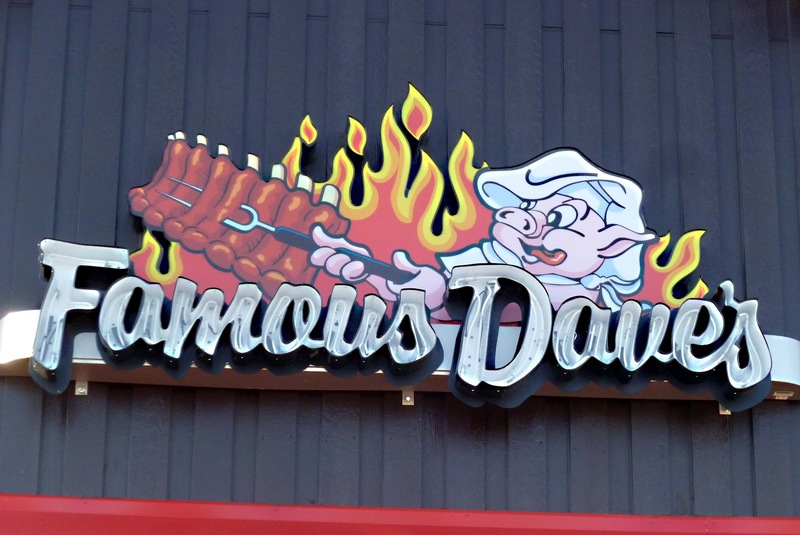 Famous Dave’s opened the Redding branch about a year ago. Since their opening they have been very popular. It was Saturday night and there was a crowd spilling out of the front door. We prepared ourselves for a wait and hunkered down to the bar. Fifteen minutes and a sudsy, cold, draft beer later we were seated. 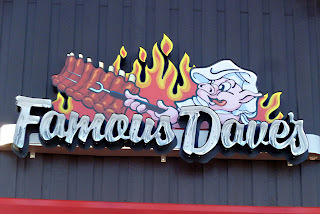 Famous Dave’s is a colorful, friendly, fun place to eat. The walls are wildly decorated with barbeque kitsch. Our waiter promptly took our orders. He returned with a small bowl of freshly made kettle style potato chips. 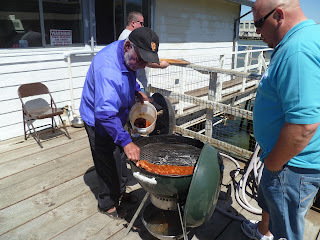 He then gave us a lesson in barbeque sauce knowledge. Every table was equipped with five different barbeque sauces. He squirted a little of each sauce on a plate explaining the style and we sampled with our chips. He mentioned a secret hot sauce and I took the bait. “Wilbur’s Revenge’ was a habanero based barbeque sauce that would light a fire under the bravest soul. With our new found barbeque sauce knowledge we were ready to eat. Our table ordered a lot of ribs. I supplemented my rib plate with some brisket. These were good looking ribs. The appearance would have scored an eight on my score card. I bit into the rib and it pulled cleanly from the bone with little effort. These ribs were cooked perfectly. 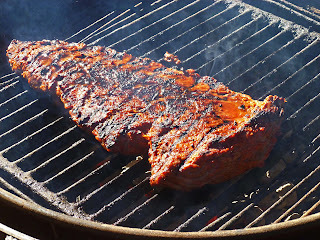 The ribs were lightly sauced. 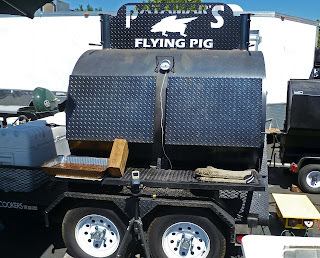 The flavor was of pork with a friendly kiss of smoke. The only fault if any was the ribs were a little on the salty side. This did not stop anybody at our table from devouring these meat bones. The brisket had been sliced razor thin. It was very tender and flavorful. The side dishes were spectacular. 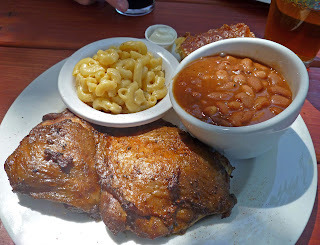 Cheesy, Gooey, Mac & Cheese, creamy Cole slaw and baked beans studded with sausage did not just accompany but starred. The warm corn muffin was the icing on this cake. Famous Dave’s did not disappoint. I was impressed that this chain restaurant could produce award winning ribs. The meats were a vehicle to enjoy our side dishes or vice versa. The sauce lesson and the fresh chips was a fun touch. Our total experience at Famous Dave’s was barbeque excellent and we defiantly will return.